Capital Risk - the possibility of sustained capital losses over the investment time frame. Reinvestment Rate Risk - the risk of investing at low rates of return, thereby failing to achieve total returns over your investment time frame sufficient to meet your goals. Inflation Risk - the chance of lost purchasing power resulting from negative inflation-adjusted returns. Different asset classes generally provide exposure to and/or a degree of protection from the different risks. As such, there is an inherent tradeoff between types of risk. For example, in most environments, fixed income securities generally provide protection from Capital Risk, but may increase exposure to Reinvestment Rate Risk or Inflation Risk (depending on the duration of the securities and the market, interest rate, and economic environments). In contrast, stocks will generally provide better protection against Inflation Risk, and to a lesser extent Reinvestment Rate Risk, but greater exposure to Capital Risk. Risk management within a portfolio should focus on prioritizing the importance of protecting against each risk. The chart below shows which common asset classes (i.e., short-term Treasury Bills, long-term Treasury Bonds, and stocks) tend to provide the greatest protection from and exposure to each type of portfolio risk. However, the most relevant risks facing long-term investors can change as the market environment changes over time. Prudent risk management should focus on prioritizing the importance of protecting against each risk and understanding which risks are the highest under current market and economic conditions. While long-term investors generally have the flexibility to pursue a growth-oriented investment approach in managing their portfolios, Capital Risk needs to be actively managed based on the current market and economic environment. For example, since many investors believe that equities outperform fixed income securities over the long run they may invest the majority of their portfolios in equity securities. While a portfolio with long-term goals should generally emphasize long-term, growth-oriented assets, a sustained period of mediocre or negative returns in the domestic stock market may prevent portfolios with systematically high equity allocations from reaching their goals. 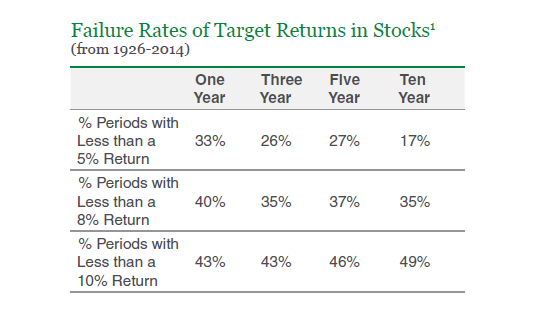 The chart below shows that despite long-term average annualized returns of approximately 9% - 10% since 1926, there is a meaningful chance that stocks may fail to earn reasonable returns over periods of time as long as ten years. For example, the S&P 5001 has failed to provide a 5% annualized return in approximately 17% of rolling five year periods and a 10% annualized return in approximately 49% of rolling ten year periods from 1926 to 2014. In fact, during the previous decade (i.e., 2000-2009), the ten year cumulative total return of the S&P 5001 was -9.01%. Thus, the equity markets can go through extended periods of time where they fail to provide returns sufficient to meet an investor’s long-term goals. Moreover, investors should understand that the forward returns of equity markets are dependent on the current environment. 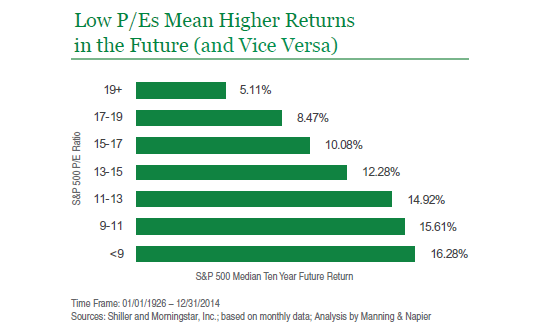 The effects of the market environment on expected returns are highlighted by the chart below, which illustrates future stock market returns following periods of relatively low and relatively high valuations. As the chart illustrates, equity securities purchased during speculative market peaks and at lofty valuations have historically provided lower returns going forward than those purchased when valuations were lower. Specifically, in the past, higher market price-to-earnings ratios have typically led to lower future ten year returns. While investors most often consider Capital Risk as it relates to their equity investments, it is important to recognize that sustained losses can also occur in the fixed income markets. For example, investors in need of income yield that have moved towards high risk speculative-grade securities in the face of the current low interest rate environment should recognize the increased risk of default in these securities. However, if investors were to allocate a large portion of their investments in long-term Treasury Bonds, these “safe” investments may lead to Capital Risk concerns as well in the current historically low interest rate environment, since interest rates and bond prices move inversely. Avoiding Capital Risk exposure altogether is generally not appropriate, nor feasible, for investors with long-term time horizons and goals. However, ignoring potential Capital Risk exposures can prevent even long-term investment strategies from achieving their goals. Moreover, as was discussed, the current low interest rate environment may make seemingly “safe” asset classes more susceptible to Capital Risk at this time. Thus, a key component of managing any portfolio is to actively manage the portfolio’s exposure to Capital Risk as market conditions change. Source: Morningstar. ©2015 Morningstar. All Rights Reserved. The information contained herein: (1) is proprietary to Morningstar and/or its content providers; (2) may not be copied or distributed; and (3) is not warranted to be accurate, complete, or timely. Neither Morningstar nor its content providers are responsible for any damages or losses arising from any use of this information, except where such damages or losses cannot be limited or excluded by law in your jurisdiction. Past financial performance is no guarantee of future results. All data are subject to revision. 1The S&P 500 Total Return Index (S&P 500) is an unmanaged, capitalization-weighted measure of 500 widely held common stocks listed on the New York Stock Exchange, American Stock Exchange, and the Over-the-Counter market. The Index returns assume daily reinvestment of dividends and do not refl ect any fees or expenses. S&P Dow Jones Indices LLC, a subsidiary of the McGraw Hill Financial, Inc., is the publisher of various index based data products and services and has licensed certain of its products and services for use by Manning & Napier. All such content Copyright ©2015 by S&P Dow Jones Indices LLC and/or its affiliates. All rights reserved. Neither S&P Dow Jones Indices LLC, Dow Jones Trademark Holdings LLC, their affiliates nor their third party licensors make any representation or warranty, express or implied, as to the ability of any index to accurately represent the asset class or market sector that it purports to represent and none of these parties shall have any liability for any errors, omissions, or interruptions of any index or the data included therein.